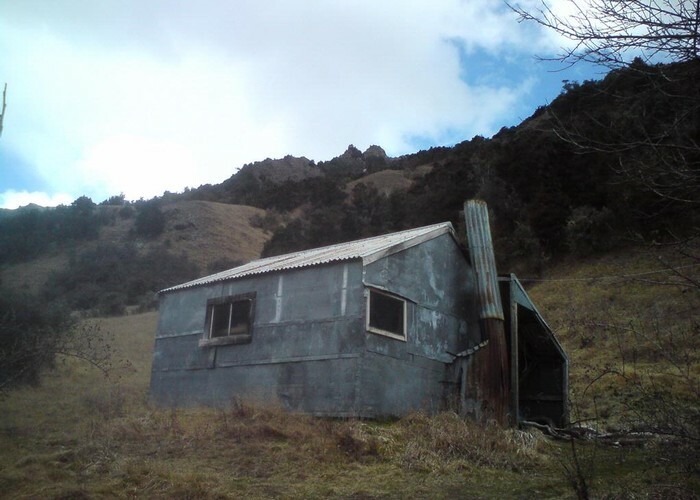 A private, but widely used hut in the lower Timaru Creek, off Lake Hawea. The hut has 4 bunks, river water and an open fire. The mouse and rat population is minuscule compared to the sheer biomass of sandflies present - and that's just those inside the hut. The chimney and various features of it's construction means that it is not in the slightest sandfly-proof. Despite the company, this is a good spot to stop for smoko (or lunch if you're slow) for those heading up to Moonlight and Roses, Stodys or Timaru huts. Upriver there are a couple of km's of riverbed walking before a sidle track starts on terraces on the TL. Junction Hut (Timaru Creek) • By madpom. Licence: cc by. Stodys Hut: Tramping track - 7km up Timaru River (note sidle track starts on TL after 2km), and a further 2km climb to the hut on the ridge to it's south-east, signposted at the track junction. Timaru Hut: 13km,track / riverbed route. Added 18 September 2011 by madpommadpom. 3 revisions, most recently 29 January 2013 by madpommadpom. 680 views in the past year (57 per month).